The 7,600-member, $75 million Puget Sound Cooperative Credit Union has continued to benefit from its decision to open a branch on a sparsely populated island off the coast of Washington State. 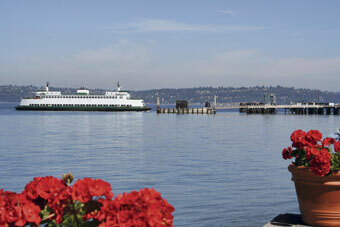 Vashon Island, home to about 11,000 full-time residents, sits in the middle of Puget Sound and is connected by ferry service to Seattle-Tacoma. Vashon Island, home to about 11,000 full-time residents, sits in the middle of Puget Sound and is connected by ferry service to the Seattle-Tacoma metropolitan area as well as communities on other islands. PSCCU opened a branch on the island in March 2011 after a group of islanders decided the island needed a credit union and that it would be more efficient to ask an existing credit union to open a branch there than charter a new institution. The existence of a such an organized group of supporters has led some organizers to estimate in media accounts that 16% of eligible adults, or roughly 1,700 people, on the island have closed their accounts at the three large banks that also have branches there and moved their money into the credit union. In addition to the credit union, local business listings record branches for Bank of America, JPMorgan Chase and U.S. Bank on the island. PSCCU CEO Kevin Ellisen said he thought the 16% estimate “might be on the high side” and wondered if there were not some duplicate accounts being counted as single accounts. But Patte Wagner, manager of the PSCCU Vashon branch and a retired employee of JPMorgan Chase, thought the number was likely accurate and predicted that it would continue to grow as customers of the island’s three banks resolved technical problems and overcame other delays to moving. “I think it’s complicated to move your financial institution,” Wagner said, “even though you might want to.” Some island residents have told her that they plan to move after they pay off an existing loan with a bank or address some other issue. In some cases, she acknowledged, there has been some peer pressure, with late comers chided by their neighbors for not having yet moved their money to the credit union. She also noted that the island’s overall culture, which has been described as a mix of Mayberry (from the old Andy Griffith television show) and the Burning Man festival, also favored a credit union. “It’s like Mayberry in that everyone tends to know everyone else,” Wagner said. “It’s like Burning Man in that there are parts of it that are just ‘out there,’” she said. “A lot of people were really shocked by the financial crises a few years ago,” Wagner said, including her. She had not started as a JPMorgan employee but as an employee of the failed Washington Mutual, which had failed in the crisis and been taken over by Morgan. “The experience of the failures and the bailouts helped a lot of people decide that local is the way to go,” she added. The numbers from the new branch seem to support Wagner. As of July 2011, the credit union reported opening 857 new member accounts, took in more than $7.5 million in deposits and made almost $1.2 million in loans from the branch. The most recent data showed the branch has taken in $20 million in deposits and made roughly $8.5 million in loans to members on Vashon, $6 million in energy efficiency loans and $2.5 million in regular consumer loans, such as auto and credit card loans. The energy efficiency loans are made to home owners who want to do things like improve their insulation or change their home’s heating or cooling system, Wagner explained. The island’s climate and the numbers of residents wanting to live on the island year round helped spark demand, she added. Even though there is a large numbers of small businesses on the island, PSCCU does not do any business lending. Ellisen said the CU was open to offering business loans but was having to move slowly to better manage its growth. When asked about the possibility of offering business loans to Vashon members, Wagner agreed with Ellisen. But she added a degree of uncertainty about the demand. The other three banks on the island were more established, she pointed out, and all three were in the market to make small business loans.